Wasn’t our last Amazon deal so fun? Well, it’s about time we run another post. Getting organized is a lot easier when you can label your shelves, cabinets and storage containers. 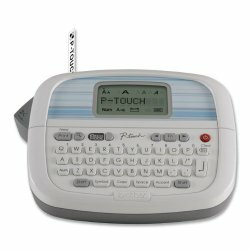 Fortunately, help is on the way: Today (August 26th only) you can buy a Brother Personal Labeler for sale on Amazon for just $9.99. That’s 68% percent off the regular price! Sometimes these special deals run out once the inventory is sold out. So, hurry on over to check out this deal!